I had been dreaming, and in the dream I was alone. It was a recurring dream, based on an experience some time ago where I had parted ways with someone; the sort of dream that when you awake, leaves a crushing feeling in your chest for several seconds, and makes you second-guess a previous decision for several seconds more. Fortunately, it was soon countered by the thought of someone else that I knew, yet did not really know; I felt a better, and smiled. It was morning, and my flight was about to land. Rubbing my eyes and peering out the window, I could see nothing except for an endless thick veil of white cloud. Eventually, however, the white darkness receded and I had my first glimpse of colourful Kathmandu. The cold mountain air banished the last vestiges of sleepiness from me as I stepped onto the tarmac. It was raining. After waiting in various lines and navigating the crowds to reach the rickety baggage carousel, I noticed a distinguished-looking chap standing to my left; he looked oddly familiar, and moreover he kept looking in my direction. After several minutes we simultaneously recognized each other; his name was Suman, a medical colleague who knew my friend Tom from Australia. I had not seen or heard from Suman in three years. He was in Kathmandu for a conference; I was not. We chatted briefly, and went our separate ways. Clearly, I was not as alone as my dream had portended. Stepping out of the airport, I grabbed a taxi to my hostel, the 327 Thamel Hotel. Another passenger jumped into the front seat at the last minute - his name was Shankhar - and told me all about his tour company, and how I would be better off booking a trek with one of his guides. I told him I'd think about it - about a dozen times - though I had no real intention of taking him up on his offer as his coincidental arrival was obviously a ploy to sell guided treks to newly arrived and potentially disoriented visitors. The 327 Thamel Hotel was clean and inexpensive, but unfortunately it also had no electric power or running water on the day that I arrived. My cheerful hostess, Dolma, explained that such minor inconveniences occurred fairly regularly. It didn't bother me anyways. After a restful night of sleep, I sipped my morning butter coffee while making polite conversation with the most delightful Nisha, the radiant young lady who ran the little restaurant beside the hostel, and then set out to see some of Kathmandu, Thamel in particular. With a population of about one million people, Kathmandu is the capital and largest city in Nepal. Thamel is the touristy hub of Kathmandu, a ghetto-like mish-mash of narrow and crowded streets, lacking in side-walks but overly abundant in motorcycles. As I sauntered along, I saw how the motorcycles tried their best to weave in and out of the crowds of people, while the people tried their best to weave in and out of the crowds of motorcycles; thus, traffic was chaotic, but kind of smooth all things considered. There were a multitude of small shops and hidden restaurants lining the congested streets as I made my way south, towards Basantapur. Basantapur, also known as Kathmandu Durbar Square, is a plaza in front of the old palace of the Kingdom of Kathmandu, a small kingdom that existed until 1768 when it was conquered by King Prithvi Narayan Shah of the Kingdom of Gorkha, marking the creation of the Kingdom of Nepal that same year. The area of Basantapur has been used as a site for royal palaces and temples since the 3rd century AD, although the oldest current temples may not have been constructed until the 1500s. Upon paying the entrance fee and fending off several tour guide offers, I strolled through Basantapur at a leisurely pace, needing a number of hours to soak it in, as the place was impressive. The architecture of the buildings was fascinating and distinctive. 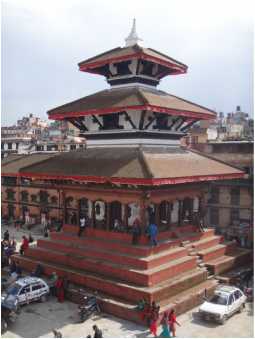 These structures were built by the Newars, the indigenous people of the Kathmandu valley since prehistoric times; their rule over the Kathmandu valley only ended in 1768, when King Shah defeated them. One temple houses one of the Kumari, a handful of pre-pubescent girls across Nepal selected as a manifestation of divine female energy in the Hindu religious tradition; at certain times, the Kumari at Basantapur makes a public appearance, but not when I was there. Within Basantapur, there was a museum dedicated to many of the last family members of the Shah dynasty, particularly King Birendra and Queen Aishwarya, both of whom died in 2001 during an incident known as the Nepalese royal massacre. The heir to the throne, Prince Dipendra, was reportedly angry over a marriage dispute; as a result, one night he consumed large amounts of alcohol and hashish, a cannabis product, walked into a family party, and shot and killed nine members of his family including his father, his mother, and himself. The Nepalese monarchy under the Shahs was abolished soon afterwards in 2008, to be replaced by the Federal Democratic Republic of Nepal. That evening, I met an adventurous couple back at the hostel, Joakin and Camilla from Norway. It just so happened that Joakin's birthday was the next day on March 4th, and it just so happened that mine was too. We seized upon this bit of serendipity, and decided to celebrate our mutual birthdays together. On the birthday morning, Joakin (I had to call him Joss as it was difficult for me to pronounce his name), Camilla, and myself spent some time exploring local art in Thamel under the tutelage of a crafty young Nepalese fellow named Sonu whom we met on the streets. There were several outstanding paintings, and we were told - though of course, I cannot verify this - that they were created using a paintbrush consisting of a single yak hair. Even were this not true, the paintings still left a mark on me, not only for their superficial beauty, but the deeper message that each and every one contained. That afternoon, we walked over to Swayambhunath, also known as the Monkey Temple for the preponderance of holy monkeys caterwauling around the place. Although Hinduism is the major religion in Nepal, with over 80% of people practicing it, Swayambhunath is a Buddhist temple. It has a stupa, or dome-shaped brick structure, founded around 500 AD. Swayambhunath is revered by Buddhists and Hindus both. The birthday evening was spent with several more Norwegians at a restaurant and bar in conversation that was part English, part Norwegian. I thought of the parallels with a birthday that I had celebrated ten years earlier, in India, with my friend Peter from Australia and a group of Swedes; I fondly recalled these previous images and words for a short while. Over the next few days I saw several more sights and several more fine meals in Kathmandu with Joakin and Camilla. To paint a realistic picture of the place, I cannot neglect to mention certain other events that I stumbled across - a child beaten repeatedly with a stick, a wounded dog lying on the street, a beggar with several missing limbs. These represented opportunities to counter suffering with kindness. Moreover, since it lies in a valley where dust and smog accumulate, Kathmandu is one of the more polluted cities I have visited. During my last couple of days in Kathmandu, I became engrossed in my preparations for a trek in the Himalayas, to see a mountain that I knew, yet did not really know. Thamel, the touristy area of Kathmandu, is rather crowded at times. The temples in Basantapur display the distinctive architecture of the Newars. The Nine-Story Palace in Basantapur. This piece of Buddhist art seems to shimmer on camera. Many parents in Nepal put eyeliner on their small children; I was told that this is done to ward off evil, and keep them innocent. Camilla converses with a young monk in Swayambhunath. Joakin and I at Swayambhunath, stupa in the background. Joakin and Camilla relaxing with their Nepalese Gorkha beers; a great view of Kathmandu lies behind them. Knowing that luck is at least partially derived from solid preparation, I double-checked all of my equipment the night before leaving Kathmandu (altitude 1,400 meters, or 4,600 feet). I have always enjoyed the freedom of removing all unnecessary items before departing upon a journey, and this night was no different. I planned to spend three weeks trekking the Himalayas, alone and without a guide; it's just my way. The next morning consisted of an early and rushed taxi ride to the domestic airport to catch my flight to the small town of Lukla where I would begin the trek. Fortunately, Isha - the young woman who had sold me the tickets for the plane - had generously upgraded me to a helicopter flight at no extra charge; I had no complaints at this dramatic turn of events. As we were driven out to the helicopter, our truck passed by Turkish Airlines Flight 726, a plane that had skidded and crashed into the runway of the international airport only a couple of days before, the day of my birthday to be exact; as a result, the whole international airport was shut down for days. The helicopter ride was exhilarating, but over in less than an hour. Touching down in the village of Lukla (2,860 meters, or 9,380 feet), I found a sunny restaurant and drank a small pot of Nepali milk tea before setting off. I started out at a slow pace. This was partly by design, as I had intended to ease myself into the high altitudes of the Himalayas, but it was also partly as a result of already being assailed by the effects of my jump in altitude from Kathmandu to Lukla. After only three hours or so of trekking, I pitched into a hut in the village of Phakding shortly after lunch. Some people are especially susceptible to altitude sickness, and after an unpleasant ordeal I had experienced in Bolivia nearly two years previously, I know that I am such a person. Altitude sickness results from the acute exposure of the body to low partial pressures of oxygen at high altitudes. The symptoms are various and nonspecific, but personally I was experiencing a respectable headache, abdominal pain, and significant fatigue upon reaching Phakding. I had an early afternoon nap, and upon drifting into oblivion I made an important observation that this journey would be different from my previous treks in that it would be measured not in kilometers of distance travelled, but in meters of altitude ascended. After resting, I made my way downstairs to have dinner and met the only other guests in the hut, a group of Czech guys represented by a hardy fellow named Jan. As I ate my vegetable momo, a type of dumpling native to Nepal and Tibet, I listened to Jan's description of their trek to a place called Gokyo Ri; mentally, I planned to make time to visit this place. Before retiring, I noticed a large poster of the Buddha on the wall of the hut that said, "Let's learn to breathe." Learning to breathe; it's just as critical in trekking as it is in meditation. As I departed the following morning, I concentrated on breathing deeply and in rhythm with my strides. I felt better, and this feeling was accentuated by the constant companionship of the wall-like peaks of Thamserku (6,623 meters, or 21,729 feet); Thamserku would be visible for many of the upcoming days. I stopped for tea a couple of times; the teahouses were usually run by pleasant Nepali women who enjoyed using the expression "Same same" a lot, a surprisingly versatile expression. Throughout the morning, I saw a handful of other trekkers, but none were solo; all had guides and porters. The porters tended to be young guys, bent over double, some hoisting an impressive number of bags. The afternoon turned into a bit of a climb as I ascended towards the village of Namche Bazaar (3,440 meters, or 11,286 feet). During the climb, I bumped into a couple of cheerful Israelis, Koby and Yam. 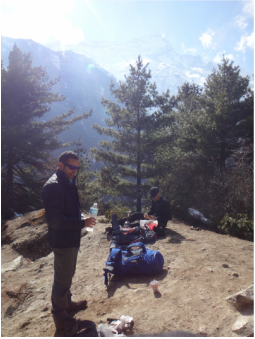 We chatted intermittently as we laboured towards Namche Bazaar. Just prior to reaching the village, they brewed up some coffee and kindly offered me two cups of the tasty beverage; I have difficulty saying no to coffee, even bad coffee. We parted at Namche Bazaar, as the guys were on a tighter schedule than me and needed to make a bit more distance that evening. Namche Bazaar is a virtual metropolis compared to the other villages that I visited in Nepal, containing numerous small hotels, restaurants, bakeries, and a couple of internet cafes. Every morning its sloping streets are filled with vendors advertising the wares from their little shops. It is a picturesque village, watched over by the impressive peaks of Kongde (6,187 meters, or 20,299 feet). I probably should have stayed in Namche Bazaar to acclimatize for a day, but I did not, and continued on the subsequent morning. The trekking that morning was gentle and scenic as I drifted along the edges of mountains. I passed by several small stupas positioned at vantage points along the way, and mighty Thamserku monitored my progress. It was on this day that Everest made her first appearance; at certain points along the way, she was visible in the distance. By the time I reached early afternoon, my slight morning headache had become stronger and my energy was low. I was moving really slowly now, so decided to stay in a tiny village consisting of a couple of huts called Phungi Tenga. I was the only guest there that evening, and the Nepali family who ran the place treated me warmly. I finally felt almost normal the next morning, and set out for the village of Tengboche (3,867 meters, or 12,700 feet) with a spring in my step. It was a good climb, but I made it there quickly, in well under two hours. Tengboche is different from the other villages along the trek for several reasons. First, it contains a highly significant Buddhist monastery for the Sherpas, the ethnic group of people that live in this most mountainous region of the Himalayas. Second, Tengboche is also the home village of Tenzing Norgay, one of the first two people to reach the summit of Everest and one of the most famous mountaineers in history. Third, it contains spectacular, though distant, views of Everest. I found a small rooftop venue manned by an old Sherpa reading bits of paper and chanting to himself. When I politely asked what he was reading, he cackled and explained that he was reciting his Buddhist prayers. "I pray every day," he declared solemnly. I sipped some milk tea and absorbed the view while he continued to chant beside me. After spending a brief moment of silence in the Tengboche monastery, I pushed on. For much of the latter part of the day I was graced with incredible views of the smooth contours of Ama Dablam (6,812 meters, or 22,349 feet). The constant sight of Ama Dablam helped to alleviate the less inspiring mud and snow that had appeared on the trail, making the trekking a bit more technical. By early afternoon, my headache had resumed, and so I stopped in the village of Pangboche (3,985 meters, or 13,074 feet). I met a fellow from the US there, named Sid, who was trekking with a guide. Sid and I had an important conversation that evening; he was experiencing a potentially pivotal moment in his life, and had been mulling over the ifs and buts of what to do about a current predicament that had him twisted into knots inside. Sid was an extremely honest person, and I somewhat admired him for confronting the systematic chaos churning within him. After some time our conversation turned to trekking, and Sid asked me, "Is it not dangerous to trek without a guide?" I had actually been asked this question a number of times already by this point in my trek, and would be asked several times more, and to me the answer is bigger than just a trek; I told Sid that I just had a different view on life - in life, if you want to really live it, a degree of risk must be accepted, even embraced; being a part of life, a trek is no different. Waving farewell to Sid early the next day, I finally noticed a few other solo trekkers amidst the guided groups, locals, and yak shepherds. 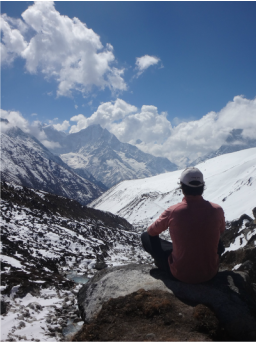 Many of the Sherpas that I ran into would say "Namaste" which - I found out later - is a customary greeting that roughly translates as "The spirit within me salutes the spirit within you." A good word. It was an easy trek to the next village of Dingboche, after which I found myself in knee-deep snow walking along a high ridge devoid of any other people. The altitude symptoms were coming on strong again as I trudged through my make-shift path through the snow. Fortunately, the trudging was briefly interrupted by a sole encounter with a British couple and their guide, who took a picture of me with the sharp edges of Taboche (6,542 meters, or 21,463 feet) behind me. By mid-afternoon, I finally dragged my feet into Thokla (4,653 meters, or 15,266 feet) where I decided that it was time to sit a couple of days and acclimatize properly. I slept a lot over the next two days, and consequently, dreamed a lot. While the mechanisms are debated and several theories proposed, for some reason, high altitude results in more vivid dreaming. Sleep and dreams; that describes at least half of my Thokla experience. When I was not sleeping and dreaming, I was spending time in the dining hall listening to traditional Nepali music and meeting interesting people. 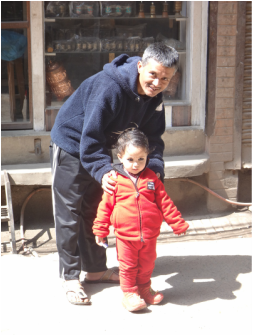 There was a terrific Japanese couple at Thokla named Neri and Megumi who were likewise stranded, as Megumi had a respiratory infection preventing her from ascending further. They were photographers, and between the two of them had travelled to a whopping 130 countries. When I remarked at how many countries he had visited, Neri just smiled softly and murmured, "It's never enough." I also met a Czech fellow in his 70s named Jarda. This guy was something else; for starters, Jarda had been trekking the Himalayas for 35 years, and he distinctively trekked while holding up a tiny umbrella at all times. Laughing to himself between every second sentence, he described himself as a scientist and explorer; he spent most of his time oscillating between the Alaskan Arctic, where he conducted research, and his research station in Antarctica, where he also conducted research. Some of his research sounded a bit over the top. In one example, he gleefully described how he had convinced some friends to trek across the width of Greenland without any navigational equipment of any kind, "Just to see that it could be done." In another example, he had convinced one of his friends - who was sitting beside him and verified the truth of it - to swim naked in the sub-zero waters of Antarctica, "To see how long it could be maintained." The answer according to his friend: about one minute. I was not sure if Jarda was for real or not, but my original Czech friend from a few days earlier, Jan, confirmed to me that Jarda, or Jaroslav Pavlicek as he is known in the Czech Republic, is in fact one of the most famous survival specialists in the country, with many accomplishments to his credit, including summits of Everest. During such lively conversations, the young Sandaya shuttled back and forth between kitchen and dining hall, preparing and serving food for everyone with a smile and nod of the head. Although he was the younger brother of the owner of the hut I was staying in, he pretty much ran the place from what I could see. Eventually after a couple of days at Thokla, I felt acclimatized enough to resume my ascent to the village of Lobuche (4,940 meters, or 16,210 feet). I had experienced great weather to this point, but now it became mediocre with many clouds in the sky. Still, it was a relatively short hike to Lobuche, so no dramas. I spent the evening talking to Zac from Canada and Kurt from New Zealand. At Lobuche I saw a couple of helicopters touch down and whisk away trekkers that for whatever reason had ascended too quickly and had developed a significant degree of altitude sickness. Over the next week, I would see one to several helicopters a day rescuing more such people from the potentially fatal effects of high altitude. The weather continued its steady decline as I continued my steady incline, and in virtual white-out conditions I carried on to the highest village of the trek, Gorak Shep (5,164 meters, or 16,942 feet). I entered one of the huts, and immediately noted an ill-looking fellow propped up on one of the benches by the door, oxygen mask at full tilt; a helicopter arrived ten minutes later to spirit him away to safer altitudes. After ordering a room and a meal from a lady named Pemba who appeared to run the show, I fell asleep. It was a good night with only a mild headache, and the weather was sunny the next morning. I made straight for the Everest Base Camp. This was not a difficult hike but the altitude was still dragging me down, and there were many times when my breathing seemed inadequate to the task at hand. Nonetheless after a couple of hours, I arrived at the Everest Memorial, a site dedicated to those fallen climbers who never made it off the world's highest mountain. Just past it was the Base Camp. As it was early in the season, the camp was not impressive, consisting of several Sherpas putting up some tents; however, had I arrived one week earlier, there would have been no tents at all. In contrast to the camp itself, the surrounding scenery was magnificent, with the imposing Khumbu Glacier shoving past it. Lying between Everest and the Lhotse-Nuptse ridge, the Khumbu Glacier is the world's highest glacier (7,600 meters, or 24,900 feet, at its source). Part of the glacier is a large icefall, called the Khumbu Icefall, which represents the first of the three most dangerous portions of any attempt to summit Everest. In 2014, sixteen Nepali climbers were killed by an avalanche in this icefall. In addition to avalanches, there are other dangers such as crevasses, some hidden, with one wrong step potentially a prelude to a fall into infinity. As I returned to Gorak Shep, I passed several small groups of trekkers led by their guides; most of these groups were moving really, really slowly, even with the guides making step-holds in the ice for their clients. While I made it to Everest Base Camp, that constant battle with the altitude had forced me to get there at less than half the pace I was normally used to. I had taken a vacation from my ego. The ego had been relentlessly telling me to push through the altitude symptoms and yet all I had to do was view it from afar and let it say what it wanted without engaging, reminding my true self to breathe and ascend slowly. My plan had been to summit a prominent hill called Kala Patthar (5,643 meters, or 18,514 feet) that afternoon or the next day, but the weather turned bad as soon as I returned from Everest Base Camp. Yet with any black cloud there is a silver lining and as I spent the next day in the dining hall of the hut I met trekkers from around the globe - Hugo from France, an eager young businessman with a huge beard delighted to be travelling the world; Liz from the US, a gentle and intelligent young researcher contemplating her future whilst trekking the Himalayas; Bao-Bao from China, a young lady whose dream it was to make a video at the top of Kala Patthar so as to inspire her friends and family in China; and Mauro from Luxembourg, an internally torn engineer with wicked dreadlocks. Someone asked me why I did not use crampons or poles. The answer was simple - I did not deem them necessary. The weather cleared up the next morning. Bao-Bao and Mauro had left early in the morning to catch the sunrise, but I wanted to leave later so as to enjoy a warmer day. I was joined by Hugo and Liz. The three of us began the slow climb up the steep slopes of Kala Patthar. En route, we passed by the exhausted Bao-Bao; despite her fatigue, she was determined to continue the climb without assistance. We carried on. As Hugo and I reached the top of Kala Patthar, we shook hands and congratulated each other. For a brief moment in time, we were the only two people at the top, and we took in some well-earned views. Liz joined us soon after. From the top, Everest (8,848 meters, or 29,029 feet), Nuptse (7,861 meters, or 25,791 feet), and Pumori (7,000 meters, or 22,966 feet) were the most prominent mountains in sight; while Nuptse appears higher than Everest from Kala Patthar, it is obviously not. As we descended Kala Patthar, we again ran into the frustrated Bao-Bao, who had conceded any further thoughts of ascent. It did not matter though; she had a great view of Everest from where she was, so Hugo and I helped her to film her video right there. I did not understand what she said, but I sensed the excitement in her voice as she spoke to the camera. On May 29, 1953, Tenzing Norgay and Edmund Hillary summited Everest for the first time in history. I find it difficult to judge the worthiness of this endeavour. Was such a climb done out of ego, or self? Both? I do not know. Regardless, to stand close to the world's highest mountain was, for me, an experience of something more. The descent from Gorak Shep to Namche Bazaar was easy. I enjoyed the company of Liz, who during one of our conversations made a poignant observation - that it is actually more lonely to trek as part of a group, as the group dynamic excludes the meeting of other people outside of that group. As a solo trekker, on the other hand, it is easy to approach and talk to other lone trekkers. I think she is right. Near the end of the descent we got stuck behind a shepherd with his seven yaks. He was different from the other she[herds - calmer, more relaxed. He did not use a stick to hit his yaks, and he whistled a happy tune to them the whole way. We chatted a bit. His name was Niro, and he taught me the various commands used to direct the yaks, such as how to tell them to go and to stop, and about their behaviour and group dynamics. He whistled to keep the yaks calm. Niro clearly used positive reinforcement with virtually no punishment, and it worked. At one point during a "yak-jam," he disappeared ahead of us with four of the yaks, leaving me responsible for the other three. I tried my yak commands - they ignored me - and after twenty minutes I saw Niro waiting for us ahead. He smiled and thanked me for guiding his yaks; I'm pretty sure he was just being polite. In total, from Lukla to the Everest Base Camp and back to Namche Bazaar, the trek lasted fourteen days, three of which were spent acclimatizing, and spanned 110 kilometers. I rested for a day and enjoyed several more great discussions with the thoughtful Liz. I then set out upon another trek, to a place that had been mentioned to me nearly two weeks previously. 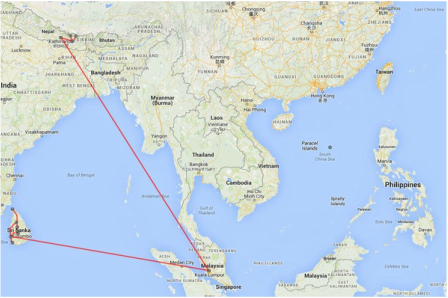 In Kathmandu, I saw Turkish Airlines Flight 726 - permanently grounded (day one). Forget fixed-wing, helicopter is the way to go (day one)! 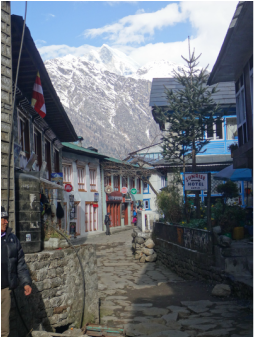 The trek commences in Lukla (day one). Ever-present Thamserku watches over the trail (day two). Pack-horses crossing one of many suspension bridges (day two). Almost at Namche Bazaar (day two). Koby and Yam preparing coffee (day two). Kongde overlooking Namche Bazaar (day two). A stupa on the way to Phungi Tenga, with Thamserku in the background (day three). The first views of Everest (far left), Lhotse (middle), and Ama Dablam (far right) (day three). During the ascent to Tengboche, Thamserku continues to impress (day four). The Tengboche monastery (day four). Yaks and their shepherds (day four). 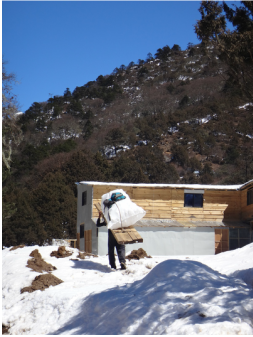 Some Sherpas carry a lot more than just a backpack (day four). Ama Dablam watching over Pangboche (day four). A lonely stupa sitting quietly just above Dingboche (day five). On the way to Thokla, Taboche keeps me company (day five). Thokla, where I acclimatized for a couple of days (day six). Me with Neri and Megumi, before they descend (day seven). Getting higher at Lobuche, with bad weather moving in (day eight). One of many helicopter evacuations (day nine). Gorak Shep, the highest village of them all (day nine). Everest Memorial, a tribute to the fallen (day ten). Everest Base Camp, with the Khumbu Glacier crawling slowly by (day ten). Hugo and Liz work their way up Kala Patthar (day twelve). Hugo is all smiles (day twelve). Liz is contemplative (day twelve). I am happy to be in a photo with Pumori at the top of Kala Patthar (day twelve). Panoramic view from the top of Kala Patthar showcasing Everest and Nuptse (day twelve). Everest from the top of Kala Patthar (day twelve). 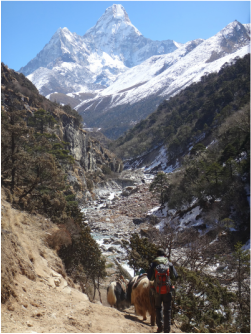 Ama Dablam beckons to Niro as he shepherds and whistles to his happy yaks (day fourteen). I set out for Gokyo late in the morning. It was bright and beautiful, and I felt fast and strong. While I wrangled with altitude sickness during much of the Everest Base Camp trek, I was now acclimatized which made a huge difference to my pace. As I branched off the trail, I overheard a group of trekkers being told by their guide that 72 hours in total were required to walk to Gokyo; I was confident that the acclimatized me would do it in less than half that time. I ascended from Namche Bazaar to the first village, Mong-La (3,973 meters, or 13,035 feet), in two hours, and rested briefly with some Nepali milk tea. I anticipated being more alone during this trek than the previous one, as the trail to Gokyo Ri was purported to be nowhere near as trodden as the trail to the Everest Base Camp. It would be good to have more time on my own, to concentrate on the now. Previously, I always viewed multi-day treks as a good chance to think about past and future, but this time I wanted to try and just experience the moment, to remove myself from the six degrees of inner turbulence created by the ego, and to focus on being aware of what was happening around me at the current moment - the now. Consequently, I tried to pay attention to every sight, every sound, and every step; I think that it improved my trekking. The trail from Mong-La consisted of a steep descent through a pretty rhododendron forest to the next village, Phortse Tenga, where I stopped and had lunch and chatted with some other trekkers. This was followed by steep ascent for the next few hours, but I just concentrated on the now and kept going. As the villages whisked by, the weather turned foggy and so I decided to put in at a collection of huts known as Luza (4,360 meters, or 14,304 feet). I chose one hut above the others for its smoking chimney, which turned out to be a wise decision for I met an interesting Sherpa there. After being shown my room, I entered the dining hall where my host, Karcan, who looked to be in his 50s, politely greeted me. I was told by a younger Sherpa staying there that Karcan had successfully climbed Everest five times, which Karcan himself modestly confirmed. Karcan remarked at my pace, saying "You are fast." I downplayed the comment, and tried to change the subject by asking him how difficult it was to summit the world's highest mountain. He just shrugged his shoulders and calmly stated the following. "Depends on the client. If he is strong like you, the summit is not so hard. If the client is not strong, many problems, and it becomes difficult." The ego felt proud that such a Sherpa was feeding me compliments, but I tried to let the pride flow over me, and not engage it. We talked a bit more, but although I was now acclimatized, I was still tired after a good day of trekking, and I went to bed. The next day consisted of a walk along a long ridge, followed by a final push towards the village of Gokyo through a valley ridden with melting snowfields. I passed several lakes, all frozen; the previous night, Karcan had told me that this was the most snow he had seen in the Himalayas in at least fifteen years. Nonetheless, the final portion of the trek was relatively flat and easy, and I made it to Gokyo (4,790 meters, or 15,715 feet) well before lunch. This was a good thing, for the smiling young Sherpa at my chosen hut served the best food I had eaten for the last two weeks. I slept and rested the remainder of the day. Early the following morning - 7 am is early for me, though not for others - I sank back a cup of black coffee and headed out to ascend Gokyo Ri, a massive hill beside Gokyo from which amazing views of many mountains were apparently to be had. The ascent was similar to Kala Patthar, though perhaps a little higher; nonetheless I kept a solid pace, and made it in an hour and a half. I was not disappointed. From the top of Gokyo RI, one has a stunning view of five of the world's "eight-thousanders"; the eight-thousanders consist of fourteen independent mountains that are more than 8000 meters high. All of these mountains are located in the Himalayan and Karakoram mountain ranges in Asia, each with a summit in the so-called death zone - the point where the amount of oxygen is generally insufficient to sustain human life. From atop Gokyo Ri, the visible eight-thousanders are Everest, Lhotse, Makalu, Kangchenjunga, and Cho Oyu. However, I paid more attention to the mountains that had accompanied me during the preceding two and a half weeks - Thamserku, Taboche, and of course, Everest. After taking some pictures, I sat on Gokyo Ri and noted that while the mountains around me were certainly large and impressive, I realized that perhaps even more impressive was the emptiness around them, the void without which none of these mountain forms could exist; the Yin, without which there could be no Yang. It was difficult to pry myself away from Gokyo Ri. I kept looking back, trying to imprint the memory, knowing I may never see Everest in the flesh again. Deep down though, you have to let go. It was enough for me that I had to some extent escaped the octavarium of the ego over the last two and a half weeks, significantly purged by the pursuit of the now and the majestic emptiness around me. I had no regrets, no worries. The walk back to Namche Bazaar was speedy. In total, from Namche Bazaar to Gokyo Ri and back to Lukla, the trek lasted six days, one of which was a rest day in Namche Bazaar, and spanned 50 kilometers. I returned to Kathmandu by plane, staying only a couple of days before leaving the country. Starting out for Gokyo, Thamserku - and this yak - continue to watch over the trail in front of me (day one). The village of Mong-La is located high on a ridge, with great views (day one). Reflecting on emptiness (day two). Lots of snow between me and Gokyo (day two). Gokyo, with the giant hill of Gokyo Ri to the left of it (day two). Thamserku, from atop Gokyo Ri (day three). Cholatse and Taboche, from atop Gokyo Ri (day three). Everest and Lhotse, from atop Gokyo Ri (day three). No matter how tough the climb and even though you have to let it go, the view is always worth the effort (day three). Being on top of the world, Nepal is the perfect place to abandon routine and the ego, a place where it is perhaps easier to experience not only the now, but also emptiness. I had flown into this country lost in the midst of a dream on a plane, but somewhere along the line dream and day had united, and in those wonderful dream-days of my Himalayan wanderings I discovered that indeed, I was not so alone as I had initially thought and felt. I was One.